Despite protestations, the coup leader appears to be settling into power. At the same time, the government appears to be intensifying efforts to eliminate members of the Shinawatra family and their closest allies from politics forever, by pursuing criminal cases against them and pushing legislation that would ban many of the leaders of Peua Thai from politics. 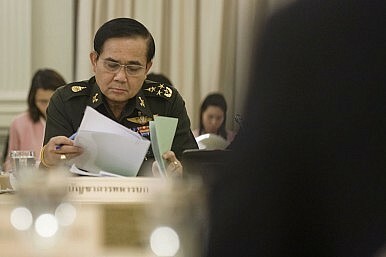 Given these repeated delays, some analysts such as Murray Hiebert and Ernie Bower of the Center for Strategic and International Studies have suggested the United States should consider “beginning to move some of these regional services and offices [at the embassy in Bangkok] to neighboring countries.” The regional services and offices they suggest moving would include the offices of the Federal Bureau of Investigation, the United States Agency for International Development, and others. Hiebert and Bower make an excellent point—the United States needs to be less dependent on an unstable Thailand. But why wait? There is no certainty that an election will be held in 2017, since Prime Minister Prayuth Chan-ocha, despite his professed weariness at leading Thailand, has settled into his role as head of government. Prayuth has kept up a whirlwind of travel that hardly suggests he dislikes the job as prime minister, and has begun the process of a Cabinet reshuffle to potentially prepare for a longer term in government. Prayuth and his allies also reportedly have packed state enterprises with their allies. Most important, Thailand’s royal succession has not yet occurred; most analysts believe that the Thai military wants to be in control of government when Thailand’s king passes away. Instead of waiting to see how long the Thai junta rules, the United States should begin the process of reducing its dependence on Bangkok now, while holding out the possibility of renewed closer relations with Thailand after elections finally occur. Beginning this process now could include making long-term plans to reduce the size of Cobra Gold exercises in Thailand—the exercises already have been downsized for the short term—or to shift much of Cobra Gold to the Philippines. It could also include making plans to increase the size of the Federal Bureau of Investigation, Drug Enforcement Administration, and other law enforcement offices in Myanmar, Cambodia, Malaysia, Singapore, and the Philippines to compensate for reducing these offices’ presence in Bangkok. Finally, reducing dependence on Bangkok could include launching plans to gradually move portions of the regional International Law Enforcement Academy from Bangkok to other parts of Southeast Asia. Given recent comments by Prayuth, it is unclear when Thailand will return to democracy. Why Thailand Returned the UyghursThailand Completes Troubling New ConstitutionThailand’s New Law Could Be Worse than Martial LawThailand Turns to ChinaThailand’s Elections? How About…Never. Is Never Good for You?